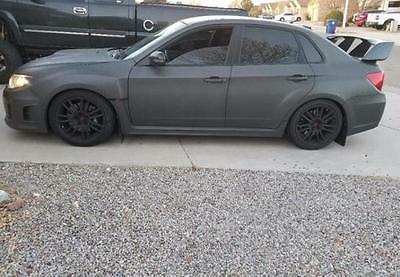 For sale: 2008 Subaru Impreza WRX 2.5l turbo. Car is a 5 speed. 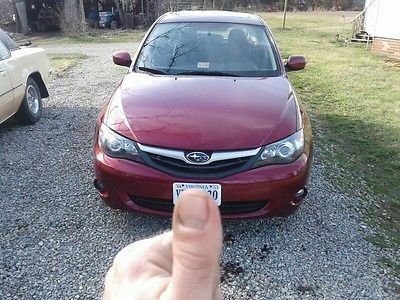 Car is in excellent condition inside and out, interior is flawless, exterior has few very minor rock chips on hood. Odometer reads 109817, but has new CCR rebuilt motor with less than 2000 miles. Also has warranty on motor through April. Rebuilt turbo, cold air intake, and new downpipe. Car drives very tight, very quick. Selling due to a death in the family. Serious inquiries ONLY. No tire kickers. Contact through email, call or text. Like new WRX. This ad was posted with the eBay Classifieds mobile app. 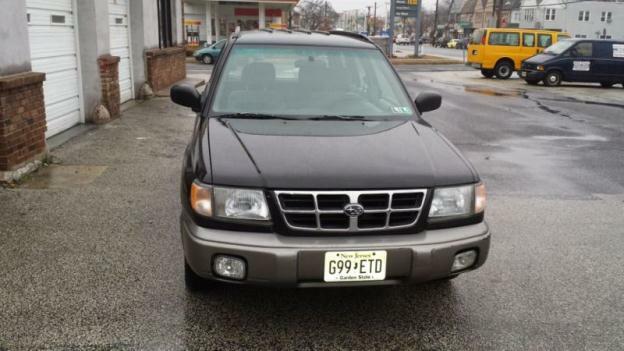 For sale is this 2 owner well maintained 2003 Subaru Baja sport AWD with excellent service history. 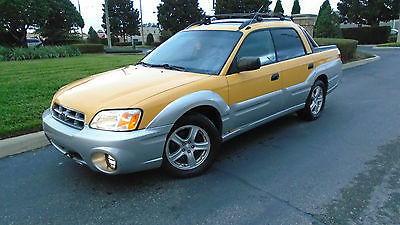 This car runs and looks beautiful RARE COLOR Yellow / Silver Comes well equipped with power windows, locks and sunroof . See autocheck Report for this excellent history . Exterior is excellent with only minor flaws from wear and tear. Interior is excellent as well with signs of daily use . Hard to find in this condition . Has 190k miles but does not drive like it . Clean Florida Title, NO Rust anywhere. Come with factory alarm and keys . Wheels and tires look great . In person inspections are welcomed and encouraged . Call-Text 321-948366O. 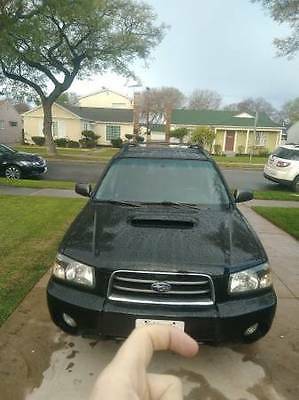 I am a licensed retailer/ wholesaler Used Car Dealer in Florida.Thanks for looking and Good Luck Biding.Title is clean and clear in hand .we specialize on Subaru and European Vehicles. ** NO DEALER FEES and WE WILL PROVIDE WITH TEMPORARY PLATE. Ebay limits photos to 24... so please take a look at the following videos for an in depth view.Start up and Drive: https://youtu.be/V-ibF9BLucAInterior Intro: https://youtu.be/uo9iFPwPP5cExterior Intro: https://youtu.be/5X4k4Op_BZYTrunk & Engine Intro: https://youtu.be/5Q3eJqSB_RYCondition (still frames with dents and scratches): https://youtu.be/5-_r5ycp7co _ _ _ CAR HISTORY:I bought this car new in Nov, 2006 and I feel the same way about it today- this should be the first STI collectors item. 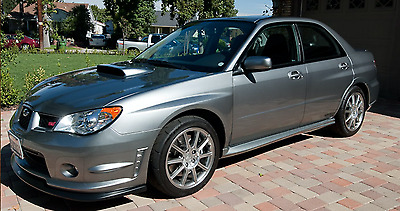 This is number 665 of 800 STI limiteds offered in 2007. Very few of these exist today and most have over 100K miles. Every maintenance (including the expensive 30K mile maintenance) has been followed to the letter. I have never had an accident in this car. The only non-maintenance replacement was the windshield. The car has passed multiple inspections from California, Washington D.C., and most recently- Texas. Every component works on this car from the lights, the seat warmers, the DCCD drive train adjuster, the moon roof, the intercooler sprayer, the six-disk changer, and all the other stuff too. Shifting is stiff and direct as you would expect. The title is clear and I expect the new owner will be very pleased with how well the vehicle runs and its condition entirely. WHAT IS THE LIMITED EDITION? :In 2007, Subaru offered 800 STIs with an "adult theme". Instead of a large rear spoiler they put a low profile lip spoiler. Instead of gold rims and red Brembos- we have silver rims and black Brembos. Instead of blue alcantara Recaros- we have full leather Recaros with seat warmers....as well as the first ever moonroof in an STI. We also have a chin spoiler custom designed for this edition (NOTE: this piece broke a few years ago and replacement is optional). PERFORMANCE PARTS:The day it arrived, I had maintenance appointments waiting. All of the following work was performed by Subaru Technicians and was covered during the full 7 years of the warranty.SPT Cold Air Intake (I can provide you the original intake if you wish)SPT Full ExhaustSubaru Subwoofer (under the driver seat)DRIVING HISTORY:It was my daily driver for a few years but for the most part I used it for cruising. It's been garage kept more often than not and I averaged around 4K miles per year. Consider going to the Youtube links above for a walkthrough of the vehicle. As for how I drove it, I think I redlined the vehicle 10-15 times total. I feel this vehicle was fast enough for what I needed it to do. So you will see the vehicle is still very tight and stiff because it's never been to the track or raced. Outside of walking you through how the vehicle runs, I can only say I've never had a breakdown and the only warranty repair was the TAKATA airbag for safety. DENTS/SCRATCHES:There are two dents on the trunk lid, two on the driver side quarter panel, and I think two inside the passenger rear door (all of which I've been told can be pulled through dentless pain repair). There are scratches in the following places: a circular pattern on the roof, a scratch on the hood, scratches across the trunk lid and rear bumper. A few scratches on the passenger side and both rear aluminum rims were curbed in a place or two. Paint has chipped on the rear bumper and there are two paint flaws on the deck of the trunk lid. As for the interior, the driver seat is in very solid condition but there is some wear on the left side of the seat. The passenger seat is very good. The rear seats were hardly used but at the top it appears the sun has "baked" them a bit- so the leather feels dry. The car could use a good interior detailing (I don't have a shop vac anymore), but even the carpets have very little wear- only around the driver's feet. All of these flaws have been identified at some point in the following videos.Interior Intro: https://youtu.be/uo9iFPwPP5cExterior Intro: https://youtu.be/5X4k4Op_BZYTrunk & Engine Intro: https://youtu.be/5Q3eJqSB_RYCondition (still frames with dents and scratches): https://youtu.be/5-_r5ycp7co Thanks for looking, good luck to all bidders and submit any questions....by the way- I'm selling because we bought a Porsche Macan. My wife said sell one or leave with both. It's a sad day :( On Feb-25-17 at 17:49:46 PST, seller added the following information: Hey everyone, thanks for looking and bidding. Be sure and ask any questions and check out the videos if you want more description on the condition and maintenance. 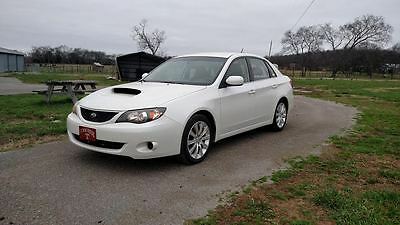 For sale Beautiful 2011 SUBARU WRX STI in excellent condition with Clean Title and ONLY 61k miles! This model is a LIMITED edition fully equipped: Leather Seats, Sunroof, DVD Player, Heated Seats, Powered Mirrors, Alloy 18" BBS Wheels, BREMBO Brakes, Turbocharged 305HP Boxer Engine, All Wheel Drive (symmetrical! ), 6 speed Manual Transmission and much more!The car is manufacture equipment except Axelback with was replaced for 3" Nameless with his Amazing sound. Please see pics and contact me anytime for details. 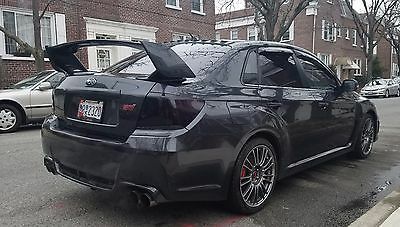 2011 Subaru Impreza WRX STI 2011 Subaru Impreza Sedan WRX, Black with 64800 Miles available now! 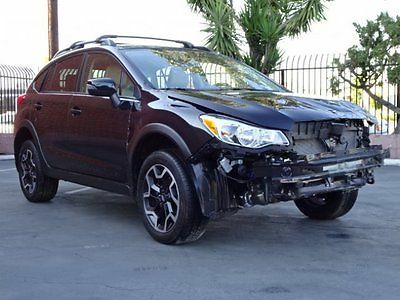 2016 Subaru XV Crosstrek 2.0i Limited 2016 Subaru Crosstrek 2.0i Limited Damaged Rebuilder Only 14K Miles Gas Saver!! 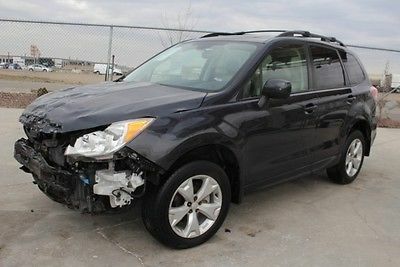 2016 Subaru Forester 2.5i Premium 2016 Subaru Forester 2.5i Premium Damaged Clean Title Only 13K Miles Economical! 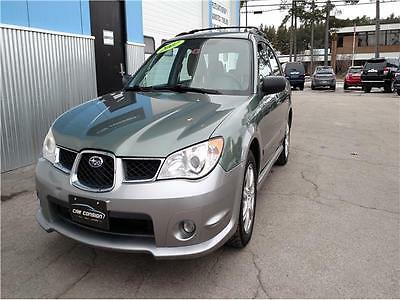 As the title states, hard to find, Subaru Forester 2.5 XT. Black paint, gray/black interior. Clean inside and out with a few bumps and scratches typical of a 12 year old car. This is a MANUAL TRANSMISSION. 5 speed. CLEAN TITLE. Really nice car. ( Heated seats, upgraded stereo (not saying much by today's standards), factory cross bars, fully functioning electronics (fog lights, heated front seats, power drive seat, etc.). The car is a blast to drive. 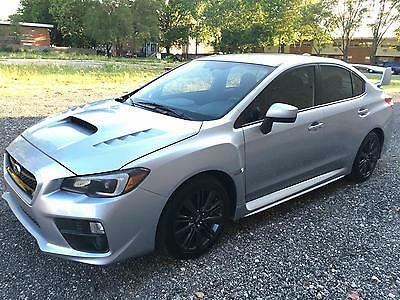 WRX/STI just with more room.137K miles. Timing belt and related maintenance done at 100K. Oil change done 500 miles ago. Why am I selling: bought this car on a whim, but wife is NOT happy. My loss, your gain. Happy wife, happy life.Other details: cash in person. Will accept certified cashier check or money order if not nearby. Price is $9500 OBO! $500 deposit due via PayPal within 24hrs of accepted offer. Motivated to get this out of the driveway ASAP. Make an offer. Worst I can say is no. Tried to show it all in the pics, but if you have specific requests, please let me know. THE CAR IS SOLD AS IS. No warranties against defects. Please review all pictures and details and ask any and all questions prior to submitting an offer. I will respond as quickly and as thoroughly as possible. The steering wheel has torn leather. INCLUDED IN SALE is a newer similar model/year wheel in excellent condition. Not installed. Would prefer local pick up, or fly in and drive (very close to LAX). Will work with buyer to facilitate shipping as well. Great wagon with low mileage. These cars go up to 300K miles easily with no problem. Selling because our family has significantly expanded and we need a bigger car. 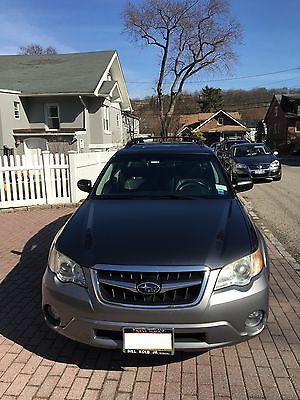 Wagon has been meticulously serviced mainly at Bill Kolb Subaru, please where we purchased it. Have all maintenance records available. Brand new Cooper tires installed with 60K life. Car will not need any maintenance except oil changes. All leather interior with Harman Kardon multi speaker system with 6 CD changer. Amazing sounds system. Tinted windows in the back. Moonroof/Sunroof. A/C works perfectly.